Kalundborg Radiophony Station was opened in 1927 on the low peninsula of Gisseløre off Kalundborg harbour. 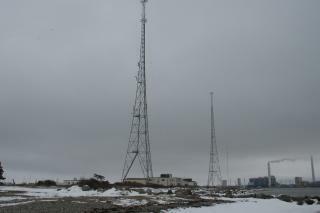 It consisted of a building for the long wave transmitter and two 105 metre-high antennae towers made by Nakskov Shipyard. The antennae itself, comprising four 160-metre cables, was suspended between the towers, which were later extended to 118 metres. In 1951, yet another antennae tower measuring 152 metres was built on the tip of the peninsula. This was to ensure good coverage for Danmarks Radio's new channel, Program 2. With the exception of the inhabitants of Northwest Jutland, where bog iron ore in the soil impeded the radio waves, all Danes were able to listen to Danmarks Radio from 1927. For years, the radio was used to raise public awareness: Many of the programmes were lectures, classical music and the news supplied by the Danish daily press, which accounts for the name Pressens Radioavis. It was also a point of reference: Everyone had listened to the same programmes and could exchange views on the subject. The Radio host's introduction: Danmarks Radio. Copenhagen, Kalundborg" underlined the Kalundborg transmitter's importance for transmitting the radio signals coast to coast – in fact far beyond the borders of Denmark. Since October 2008, though, the long wave transmitter has sent only a call signal, and the future of the medium wave transmitter is only secure until 2010. "